The 2016 Perth-Winterbottom Stake Day race turned out to be more entertaining than anyone thought. Dubbed the Gentle Giant, Takedown beat out all the competition to win the Winterbottom Stakes by a quarter-length. Sitting at odds of $9, Takedown placed fifth in the Group 3 Chatham Stakes at Flemington and was clearly not the favourite going into the race. After a good start, Takedown took a while to chase down Sheidel but eventually ran down the mare in the final straight to claim the win. The Gentle Giant has barely crossed the line before trainer Gary Moore leapt onto the track to do his own victory lap, waving his hat and hugging anyone who got close the outside fence. On any other day, the biggest story would have been the upset and disappointing performances of Terravista and Malaguerra. But it was all overshadowed by Gary Moore and his antics on the field. His story is one of intrigue and heart-warming dedication. His belief in the Gentle Giant is nothing short of amazing. No one but Moore could see the horse’s potential as the elephantine equestrian galloped into various placings previously in the year. Moore himself was an international jockey who lived in the shadow of his legendary father George Moore. His greatest achievement in the saddle was winning the Prix de le’Arc de Triomphe in the 1980’s. Moore became a leading training in the industry and arrived in Australia two years ago. The Winterbottom stakes was Gary’s first Australian Group 1 win. Filled with confidence, Moore now believes that Takedown has a real shot at the Hong Kong Sprint. Takedown joins Rebel Dane as the only two Australian representatives in the prestigious international meeting. The Perth-Winterbottom Stakes Day race was filled with equal measures of jubilation and disappointment. 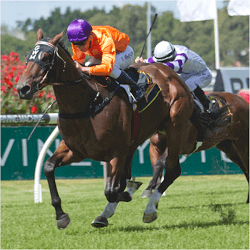 Terravista dropped out completely to the tail end of the pack while Darley Classic winner Malaguerra took fifth and never looked threatening at all. The placing for the race was as follows.